Casa Lugeo with its quiet location and large size, will give you a beautiful vacation experience. On the large, roofed balcony with a fireplace you can sit sheltered and enjoy the sun and the wonderful panorama. The lovely garden has plenty of space for private recreation, and the refreshing lake is just a few meters away. Through the large windows in the living-room you have the view to the lake and the mountains even in cool weather. Casa Lugeo is very suitable for two families with children, an extended family or a group as well, since upper floor and ground floor have seperate entrances. If you want to you have room to adjourn to, but at the same time the plentiful facilities of the upper floor allow for all guests jointly too cook, eat and get-together. The large garden is ideal for children to play in, since it is enclosed by tall hedges and fence respectively. Close to the beach: Distance from the beach: 100 meters. The road, where Casa Lugeo is situated, leads to the lake directly into the water. There boats can be launched. Large estate, ideal for children to play in: The detached villa has about 1000 sqm land size. The estate is enclosed by tall hedges and fence respectively and a tall gate, ideal for even small children to play in. Quiet neighbourhood: Casa Lugeo is in a quite location. The properties in the neighbourhood have single houses, mostly with large gardens as well. In the garage there is room for two cars. The dish washer is in the kitchen upstairs. Upstairs there is plenty of dishes, glasses for 12 persons and large pots and pans and cooking utensils. Downstairs there is kitchen equipment fpr 6 persons. A collection of board games, card games, children buldings blocks and several puzzles are in the sideboard in the living room. Also the games 'Mastermind' and 'Qwirkle' and some books. The table on the roofed balcony is extendable and has 8 chairs, another table with 6 chairs is in the garden. There is a (ladies') bicycle with a lock and a basket to e.g. get panini for breakfast. Upper floor and ground floor have seperate entrances. Throughout the house there are stone or tiled floors which are easy to clean (no fitted carpeting). There are no child-proof locks for power socktes installed. There three parasols and two foldable laundry racks. Internet-Hotspot: only a few steps away from the house outside the restaurant Lido there is an Internet-Hotspot, where you can connect to the Internet via Wifi. The town of Maccagno provides this free-of-charge service via the provider InternetOne.it; you only need to registrate your mobile number once, to receive a pin-code per SMS. Wir habe das Haus wieder mit 8 Personen aus 3 Generationen genutzt. Und Hund. Die Lage, Ausstattung, der Zustand des Hauses ist supergut. Bei bestem Wetter könnten wir die Nähe zum See oft zum Schwimmen nutzen, Sonnenbaden am Strand oder im schönen abgeschlossenen Garten, Ausflüge in die Berge oder über den See, da blieb wieder kein Wunsch offen. den nötigen Utensilien ausgestattet. Erwähnenswert ist die tolle Terrasse ebenfalls im 1. Stock. Auch bei Regen bestens nutzbar - und wo kann man heute noch Fledermäuse beim abendlichen Ausflug beobachten. Die Kinder konnten sich im sehr großen Garten ungestört aufhalten. Der Weg zum nahen See wurde teils mehrmals am Tag gegangen. 3 und 1 Jahr, waren Wasserspiele angesagt. Der Markt in Luino war toll. Trotz Regen. Auch über die örtliche Gastronomie können wir nicht viel sagen, da wir 3 Köche in unseren Reihen hatten und auch wegen der Kids gerne selber kochten. Die Einkaufsmöglichkeiten sind recht gut. Das Restaurant am Lido (Plastikeinrichtung -trotzdem ordentliches Tischgeld) hat uns nicht vom Hocker gerissen. Außerdem ist das Personal nicht gerade freundlich. Erwähnenswert ist die Pasticceria gegenüber dem Supermarkt in der Hauptstraße. Guter Kaffee und leckeres Gebäck. Wir verbrachten eine wunderschöne Woche Anfang Oktober in diesem Ferienhaus. Es ist gut ausgestattet, sehr sauber, und bestens für zwei Familien geeignet. Wir waren vier Erwachsene und zwei kleine Kinder, 3 + 6 Jahre alt. Genug Platz für alle und der tolle Garten ist für die Kinder super!! Die überdachte Terrasse war großartig, wir konnten jeden Tag draußen Essen, selbst bei Regen!! Nur ca. 100 Meter bis zum Seeufer, und weitere 100 Meter bis zur Schiffsanlegestelle. Wir haben zwei Ausflüge per Schiff unternommen, Markt in Luino. ( Sehr voll, und alle Waren wurden dutzendfach angeboten, kann ich nur bedingt weiterempfehlen) Und per Schiff nach Cannobio, war traumhaft schön, sehr schöne kleine Altstadtgassen und gemütliche Cafes. Unbedingt per Schiff, und nicht am Markttag anschauen!!! Vielen Dank an die Vermieter, wir wurden toll betreut!! Vielen Dank für diese ausführliche Beschreibung! Wir freuen uns natürlich sehr, wenn es unseren Gästen so im Casa Lugeo gefällt, daß sie wiederkommen! Wir waren 4 Paare im Alter von 55 + und haben uns speziell abends auf der großen Terrasse des Hauses sehr wohl gefühlt. Bis auf einen wunderbaren Ausflug in das Verzascatal haben wir alle Sehenswürdigkeiten und schönen Ortschaften um den See mit dem Schiff erkundet und das Auto nicht bewegt. Die Anlegestelle ist ca. fünf Minuten vom Haus entfernt. Cannero, ein sehr gepflegter Ort, hat uns besonders gut gefallen. Wir freuen uns, wenn sich unsere Gäste im Casa Lugeo wohlfühlen! Une agréable villa à deux pas du lac dans une rue calme d'un village italien typique. L'accueil a été parfait et en français, que demander de plus. La maison est spacieuse avec tout le confort et le nécessaire, même pour une grande famille (nous étions 4 couples avec des bambino). Vraiment très reposant et agréable, vous serez enchanté par une petite ballade au bord du lac avec son panorama sublime sur les montagnes et que dire le matin qu'en on prend son petit déjeuné avec la vue sur le lac. Je la recommande chaudement, vous serez certain de passer de superbes vacances. Un grand merci à Vera et sa famille. 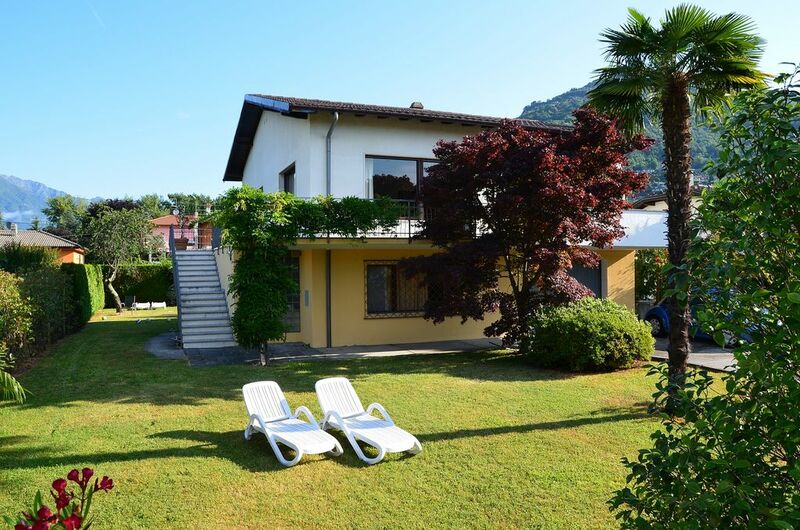 Casa Lugeo is a very pleasant house just a step from the Lake Maggiore in a typical Italian village of the Alps. We have passed very good holidays in Casa Lugeo. The house is very comfortable and we have liked in particular the welcome in french. Thank you very much Vera for this very pleasant holidays, it was very quiet and restful. Absolut perfekt ausgerüstete Küche, schöner großer Garten zum Spielen und Sonnen bestens geeignet. Sogar bei Regen ein Highlight. Maccagno is a perfect starting point for bicycle and hiking tours. It has a charming center, good shopping opportunities and one of the few grass beaches on the lake. There are more than a dozend restaurants, pizzerie and bars, some are located directly on the beach or water front. Within 10-15 minutes walking distance from Casa Lugeo there are supermarket, baker's shop, pastry shop, newspaper kiosk, tobacco shop with bar (tabacchi), hairdresser's, pharmacy, post office and bank with cash machine, all with parking slots in front of the door. A car makes shopping and trips in Maccagno and surrounding area very convenient, but one can reach shopping facilities and many destinations very good by foot, by train, by bus or by ship. Endreinigung + Bettwäsche 230,- EUR (obligatorisch). Bitte bringen Sie Ihre eigenen Hand-, Bade- und Geschirrtücher mit. Wochenmietpreis inkl. Nebenkosten wie Wasser, Strom u.s.w. Haustier 35,- EUR je Haustier pro Woche An- und Abreisetag nur Samstag! Bezahlung per Banküberweisung. Anzahlung 25% vom Gesamtpreis spätestens etwa sechs Monate vor Anreise, Restbetrag vier Wochen vor Anreise. Nach Eingang der Anzahlung gilt Ihre Buchung als verbindlich. Sollte die Reise nicht angetreten werden, werden gezahlte Anzahlung bzw. gezahlter Restbetrag abzüglich Endreinigung+Bettwäsche nicht zurückerstattet. Kann allerdings das Haus in Ihrem gebuchten Zeitraum anderweitig vermietet werden, erstatten wir Ihnen einen Betrag, der dem erzielten Mietpreis der Neuvermietung entspricht bzw. der daraus resultierenden Anzahlung (kann evtl. niedriger sein durch einen Sonderangebotspreis). Die separate Service-Gebühr von Fewo-direkt zahlen Sie an Fewo-direkt mit der von Fewo-direkt angeboteten Zahlungsart z.Zt. Kreditkarte. ----------------------------------------------- Final cleaning + bed linen 230,- EUR (obligatory). Please bring your own hand-, bath- and dish towels. Weekly price includes all costs for water, electricity etc. Animal 35,- EUR per week. Arrival/departure day Saturday only! Payment via bank transfer. 25% of total amount as advance payment latest about six months prior to arrival, remaining amount four weeks prior to arrival. After receipt of advance payment your booking is considered binding. If you don't arrive, paid for advance payment and remaining amount respectively less final cleaning+bed linen will not be refunded. However if the house can be rented otherwise during your booked period, we refund an amount that corresponds to the realized rental price and the advance payment respectively (may be less due to a special offer). The service fee of Fewo-direkt/HomeAway is payable directly to Fewo-direkt/HomeAway via their offered payment method (credit card).